First Line: "I peeled away the cheap, greenish-gray paint on the wall of the third floor girls' bathroom"
Review: Paige is considered the crazy girl in her school but in reality she can see ghosts who are stuck in the Dark World. And once we find out that the boy who is always borrowing her extremely girly pens in class is a demon slayer sent there to protect her we learn that she is actually what they call a Traveler someone who can open portals between worlds and now a whole slew of demons are after her to bring her back to their queen. The first few chapters into The Dark World I really thought it was going to be a five star book but things kind of went south for me once Logan entered the picture. Now there was nothing wrong with Logan's character as a matter of fact I loved Paige, Logan and her insanely funny ghostly best friend Dottie but once Logan revealed who he was most of the plot became about their growing feelings for each other. At first I thought it was cute the romance between the two but then a few chapters after that I was wondering okay now can we get back to the action packed demon slaying part of the story which didn't happen until the last remaining chapters of the book. 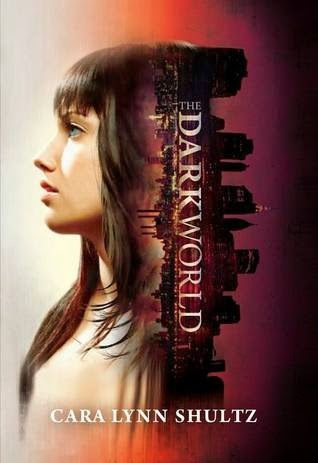 Also the book is called The Dark World and everything we are told about it from Dottie and Logan makes it to be a horrifying place that I was dying to see our main characters get thrust into but this first book in the series most of the time was spent in our world and not until the very end did Logan and Paige go to the Dark World, I felt a little cheated with that but at least I know the next book should be mainly based in that world. If I had to pick my favorite character out of this book it would be Dottie she was downright hilarious. I loved the Paige and Dottie friendship duo they were so entertaining together which is why I was a little annoyed that we saw less of Dottie when the whole romance portion kicked in. Anyways I'm hoping there will be more of her in the next book then there was in this one. Also Paige was very likable as well, she was witty and sharp and I admired her for not letting all those kids at her school get under her skin when they made fun of her because they thought she was crazy. Then there was Logan who was just so sweet and kind there is nothing bad to say about him. Overall I liked it the romance portion could have been toned down a bit but it was still a great start to a new series. Memorable Quotes: ~“ Maybe he was merely a legitimately nice person, nonjudgmental and kind. I'd read about those mythical figures in books, although I sure as hell hadn't met any. I'd figured they'd gone extinct with the dodo bird." ~"You, Paige Dawn Kelly, are a wrecking ball to my routine, colorless life," he said, finally meeting my eyes, "and I couldn't be happier or more terrified about it."